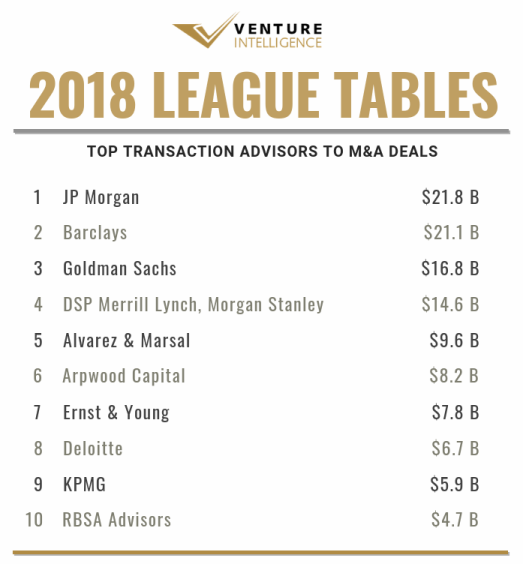 JP Morgan topped the Venture Intelligence League Table for Transaction Advisor to M&A Transactions in 2018. JP Morgan advised M&A deals worth $21.8 Billion (across 5 qualifying deals) during the period. 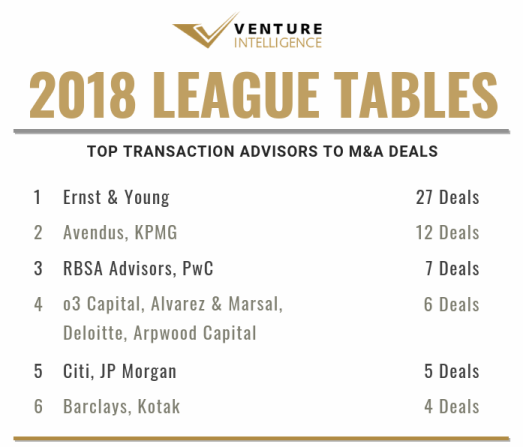 Barclays ($21.1 Billion across 4 deals) and Goldman Sachs ($16.8 Billion across 2 deals) took the second and third spot. DSP Merrill Lynch and Morgan Stanley which advised the $14.6 Billion merger between Indus Towers and Bharti Infratel took the fourth spot. 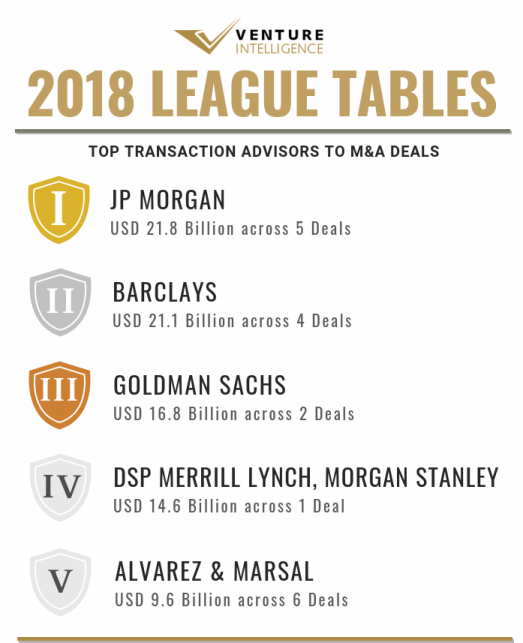 Alvarez & Marsal ($9.6 Billion across 6 deals) came in fifth. The top three transaction advisors had advised the $16 Billion acquisition of Flipkart by Walmart. Apart from the Walmart-Flipkart deal, JP Morgan and Barclays also advised the $4.2 Billion takeover of Arysta Lifesciences by UPL Limited. Alvarez & Marsal advised deals includes ArcelorMittal's take over of Essar Steel under the IBC-led process. 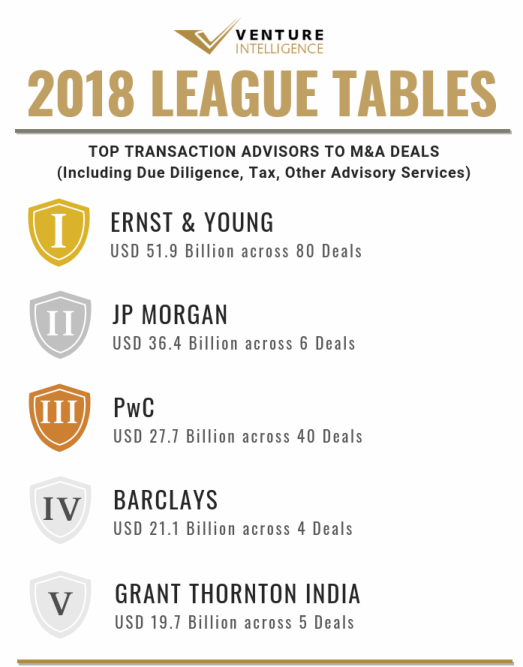 EY topped the tables in terms of deal volume with 27 deals (worth $7.8 Billion) during the year. 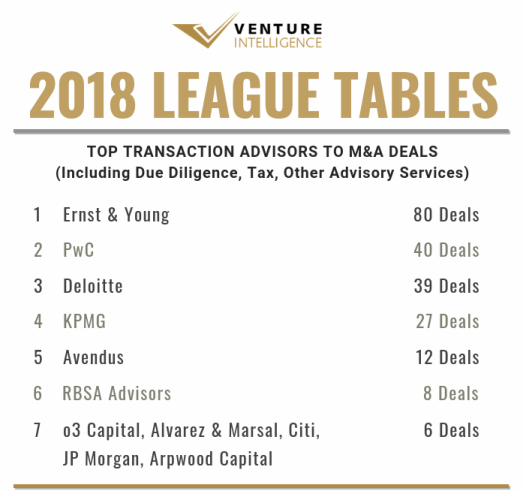 Avendus and KPMG took the second place advising 12 deals each. PwC and RBSA Advisors occupied the third place with 7 deals. Alvarez & Marsal, Arpwood Capital, Deloitte and o3 Capital shared the fourth spot with 6 deals each. 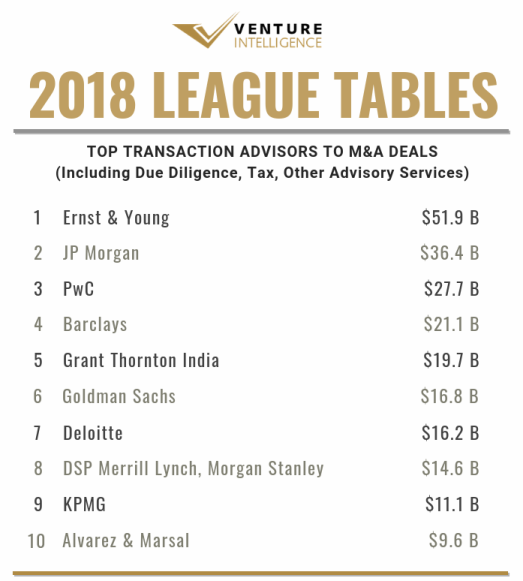 Inclusive of its roles in due diligence and related advisory activities, EY also topped the tables advising deals with a value tag of $51.9 Billion (across a total of 80 qualifying deals) during 2018.